The Bolt Harness becomes a sleek mystery when done with black on black leather and hardware. The Bolt is a sleek masculine look. 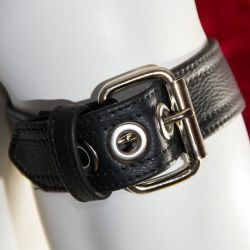 Black leather done with black hardware, four rings and six buckles connected with black leather straps. This gear is for someone who is not only mysterious, but substantial. The best thing about full grain leather is the way it feels when worn against the skin. We use hides of full grain leather to make a piece of gear that holds you just right during the most important moments.